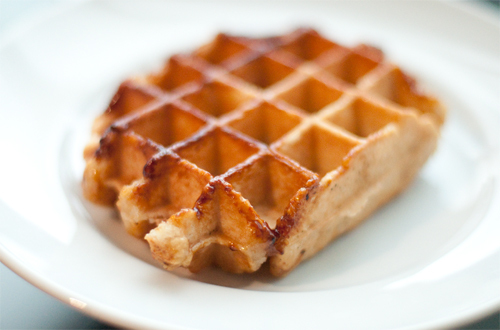 On the menu for tonight : Liege Waffles. I've been experimenting a bit with these, I've tried a few different recipes; a desperate search to find one similar to one we had in Montreal. At first I wasn't sure how much I liked them in comparison to regular old "Belgian" waffles that we usually make, but now I prefer them. They are dense and doughy and a little goes a long way. We have never made them with Pearl sugar though, we've just rolled them in another sugar we had lying around. Still, the results were super and quite tasty. It's like a meal and desert in one! This recipe is also really good.